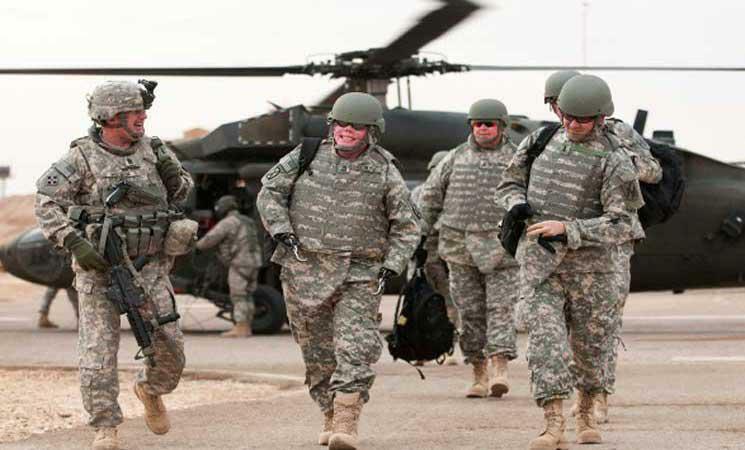 During the last period, sharpened statements issued by the political forces demanding the withdrawal of US troops from Iraq, especially after the visit of US President Donald Trump secret to the base of al-Assad east of Anbar to celebrate with the soldiers Christmas. According to information issued by Iraqi non-official sources, the number of US troops in Iraq is 9,000. Security sources said yesterday that US forces moved near military bases in the Habbaniyah and al-Rutba areas east of Anbar, while the popular crowd was talking about preventing US forces from conducting a field survey, which he described as "suspicious" of the security measures within its limits. "The American provocations have come to reveal the secret information of our troops stationed at the border," the commander of operations in Anbar, in the crowd Qasim Musleh said in an interview quoted by the crowd and read by Mawazine News. "The US forces are working to take accurate and sensitive information from the security forces stationed on The Iraqi-Syrian border. " Musalh said that "the command of Anbar operations to the crowd prevented US forces from completing the survey, forcing them to return to the base of the well and not to approach the popular crowd." He pointed out that "US forces surveyed a distance from the Iraqi-Syrian border and asked questions to the border police and the Iraqi army summarized the number of combat points at the border and the amount of ammunition and the type of weapon and the number of personnel present at each point," stressing that "this information reveals the secret forces stationed, Easy, because that information was very dangerous. " And called on political blocs to remove the US forces, as its presence in the country is no longer justified, after the war on the organization of a supporter of the terrorist. US forces have entered Iraq after a terrorist organization was established in 2014, and according to government statements, its mission is to provide advice and training to Iraqi forces, as well as air raids on sites called for by the International Coalition to eliminate it. "Some MPs fear that America will use its presence to launch a military strike against Iran or some neighboring countries," said MP Haneen al-Qaddo. He explained that "the numbers of soldiers are increasing and this raises many doubts," noting that "the members of the House of Representatives are working to mobilize efforts in the House of Representatives to cancel the strategic agreement or modify." "The base of Ain al-Asad east of Anbar is a forbidden American zone, and the Iraqi forces did not reach it," member of the parliamentary security and defense committee Abbas al-Sarut told Mawazine News. He added that "talks are about the withdrawal of US troops from Syria and its entry into Iraq," noting that "this matter a violation of Iraqi sovereignty and contrary to the security agreement between Baghdad and Washington." "The House intends to discuss the US presence in the next parliamentary sessions." For his part, demanded the leadership of the coalition of reform MP Ali Sheikh, Tuesday, Prime Minister Adel Abdul Mahdi, to clarify his position on the US demand to resolve the resistance factions and the popular crowd in Iraq. Sheikh said in an interview that "talk about the presence of US movements as well as the escalation of US calls against the resistance factions in Iraq, the Prime Minister Adel Abdul Mahdi, in front of an illustrative position of great concern about these files." The MP called on the government to "preserve the sovereignty of the state and not to exceed other countries on the reputation of Iraq and the Iraqis," calling for "a clear and national response from the office of Abdul-Mahdi to those who interfere in the internal Iraqi affairs." The newspaper "Al Arab" London has published a report has not been verified that Washington provided a list of 67 factions of the Islamic Resistance and popular mobilization to Prime Minister Adel Abdul Mahdi, demanding their dissolution.